Traditional small-scale lagoon fishing uses tools that require excellent knowledge of the biology of the species being fished, reproduction periods, seasonal migration and daily movements governed by the tides. This type of fishing therefore requires considerable professional skill which cannot be in any way improvised, to the point of the small-scale fisherman’s trade being passed on from generation to generation. Open lagoon fishing uses trawling or static equipment and there is special gear for each species and period of fishing. 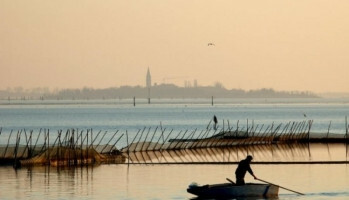 Two of the Venetian lagoon’s most antique and traditional fishing activities are “novellame” (young fish) and “moeche” (softshell crab) fishing.